John VINCENT (1608 – 1663) was Alex’s 11th Great Grandfather; one of 4,096 in this generation of the Shaw line. John Vincent was born about 1608 in England. His parentage is quite uncertain. It has been alleged that he was the child of Sarah Allerton and her first husband, John Vincent. If so, he was left behind in Europe and came to New England on his own as an adult. He married Hannah SMITH. John died 1663 in Yarmouth, Barnstable, Mass. 1. Elizabeth Vincent 1630 Thomas DEXTER Jr. In Leiden on 4 Nov 1611, Degory Priest of London married Sarah Vincent, widow of Jan Vincent of London. [Mayflower Descendant 7:129-30]. Together they have two daughters. Priest dies on 1 Jan 1620/21 and news of that event is conveyed back to Leiden where his widow remarries in November 1621 to Godbert Godbertson [sometimes transliterated as Cuthbert Cuthbertson]. All four, that is, Sarah, Godbert and her two daughters, arrive in Plymouth in 1623 on the Anne. Both Godbert and Sarah die “without will” before 24 Oct 1633 when their inventory was spoken of. [Plymouth Colony Records 1:11-13]. Eventually their estate was settled on 3 Aug 1640 to John Combe and Phineas Pratt who had married the two daughters of Digory and Sarah (Allerton) Priest. No mention of John Vincent, the man of Sandwich, is ever made in connection with Sarah (Allerton) (Vincent) (Priest) Godbertson, whether in Plymouth or Leiden records. One would have to believe that the younger John Vincent was left in England and Sarah went to Leiden alone. After all the intensive research done on Mayflower families I find it hard to believe that not one record has surfaced that ties the two together in some way. Unlike some theories, here the timeline works. A woman born in 1575 has a son in 1600 and then two more daughters in 1613 and 1615 (when she is about forty) and no more children. Isaac Allerton’s birth year is ca. 1586 based on his own deposition and it all holds together. However, John Vincent is a much more common name than you would think. A search in the IGI for parish records (not patron submissions) shows four John Vincents born in London between 1600 and 1610. If you include all of England and reduce the birth years to 1600 to 1604, there are still 14 John Vincents. Certainly the John Vincent of Sandwich was a man of some social importance. He is a leader of Sandwich from the beginning and given the honorific “Mr.” in town records. Further research is needed in England to find his origins. However, for now, his connection with Sarah Allerton is based solely on her marriage record as a widow of John Vincent. Intriguing? Yes. Evidence? No. Certainly not anywhere close to being a reasonable determination of a relationship. Genealogical notes of Barnstable families Vol 1, p 68: The Indian title to the lands in Sandwich was purchased by William Bradford and his partners of the old Plymouth Company in 1637, for £16, 19 shillings, payable “in commodities,” and Jan 24, 1647/48, they assigned their rights to Edmund FREEMAN, and on the 26th of February following, he assigned the same to George Allen, John VINCENT, William Newland, Robert Botfish. Anthony Wright and Richard Bourne, a committee of the proprietors of the town of Sandwich. John Vincent was of Saugus (today’s Lynn), Essex, MA by 1636 but was granted lands in Duxbury, Plymouth, MA. His Duxbury land abutted the lands of Thomas Burgess and William BASSETT, both early settlers of Sandwich. He was made freeman in 1637. In 1638, he was appointed Constable in Sandwich. By 1639 John sold the Duxbury land to Thomas Weybourne, and that same year was appointed Deputy to Plymouth Court from Sandwich. Also in 1639, he was appointed to go to Yarmouth to aid in establishing land rights. He was also listed in the 1643 roster of persons between the age of 16 and 60 who were liable to bear arms. This man has a research history very similar to John Ellis who also lived in Sandwich. Both may or may not have ties with the Mayflower, but certainly some researchers have insisted they do. The best write-up for John Vincent is by Harl Preslar Aldrich, Jr. in George Lathrop Cooley and Clara Elizabeth Hall: Their Ancestors and Descendants in America (Rockport, Me. : Penobscot Press, 2001), pp. 213-215. Aldrich claims that John Vincent was in Duxbury by 1637, however, there is no record of him being admitted a freeman there. He lives his life in Sandwich and later in Yarmouth, Mass. He has four children, all of whom are captured from their own respective marriage records. John Vincent himself leaves no will or probate. John’s children in order of their marriages and therefore extrapolated births are: (i) Elizabeth m. Sandwich, 8 November 1648 [poss. confused with the next record; first child born in 1649], Thomas Dexter (Jr.) and born say 1625; (ii) Mary m. Sandwich 8 November 1648 [Sandwich VRs, p. 8] Benjamin Hammond, and born say 1627; (iii) Sarah m. 8 July 1653 at Barnstable [Mayflower Descendant 4:223] William Dexter [brother of Thomas above] and born say 1631; and (iv) Henry m. 15 December 1657 at Sandwich [Sandwich VRs, p. 15], Mary Matthews, and born say 1634. The dating of the children is important because you need to be able to date the parents. Based on the above information we can say that John Vincent was married about 1624 and was likely born about 1600. Elizabeth were considered synonymous or interchangeable. 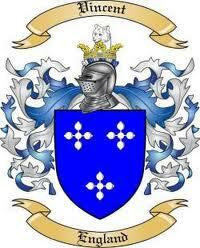 Sarah’s husband William Dexter was born about 1630 in England His parents were Thomas DEXTER Sr and Mary HARPER. William died 1694 in Rochester, Plymouth, Mass. Williamm died intestate, and his estate was settled by mutual agreement between the widow Sarah and her children, Stephen, Phillip, James, Thomas, John, and Benjamin Dexter, and her daughter Mary, wife of Moses Barlow. James, Thomas and John, had the Rochester lands, and Stephen, Phillip and Benjamin, the Barnstable estate. In the division of the meadows in 1694 William had 3 acres assigned him by the committee of the town, which was reduced to two by the arbitrators in 1697. Stephen and Phillip, the only children of William of sufficient age, were assigned 2 acres each. In 1703 Phillip had removed to Falmouth, and Stephen was the only one of the name who remained in town. He had 48 shares alloted to him in the division of the common lands, considerably more than the average, showing him to be a man of good estate. Henry’s wife Mary Matthews’ origin is not known. i. John Vincent b. 1685 in Yarmouth, Barnstable, Mass. ; m. 2 Nov 1710 in Harwich, Mass. to Hannah Sears (b. 1 Jul 1685 in Harwich, Barnstable, Mass -d. Harwich or Dennis ) John and Hannah had six children born between 1712 and 1732. Mary’s husband Benjamin Hammond was born in 1621 in London, England. His parents were William HAMMOND and Elizabeth PAYNE. . He went to Sandwich, and there in 1650 married Mary Vincent. Nothing is known as to his whereabouts from his arrival in Boston, in 1634, to his marriage to Mary Vincent in 1650, except that he was at Yarmouth in 1643.
i. Mary Hammond, b. Sandwich, Barnstable, Mass; d. young. v. Benjamin Hammond, b. Nov. 1673.Sandwich, Barnstable, Mass; d. 29 Mar 1747.
vi. Rose Hammond, b. Sandwich, Barnstable, Mass;d. 20 Nov 1676. This entry was posted in 13th Generation, Immigrant - England, Line - Shaw, Pioneer, Public Office and tagged Legendary Mayflower Roots, Sandwich Founder. Bookmark the permalink.